Well, the heatwave hasn't yet broken (40C+ here again today - eugh) so I have packed up the kidlets and spent the past two days at my parents' air-conditioned house. We're all feeling much better and the kids have managed to have a decent sleep each day, so I'm certainly feeling much happier! My mum is keen on indoor plants, and has a few beautiful peace lilies throughout the house. Looking at them reminded me of a really interesting article I read a while ago on indoor plants and how they have a dramatic purifying effect on our indoor air. 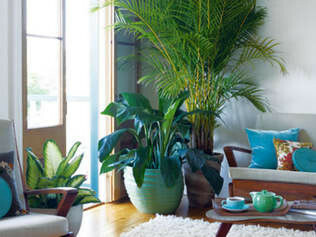 Studies have shown that the air we breathe indoors is actually more heavily polluted than the air we breathe outside and that indoor plants help filter the air of these toxins, which are released from our furniture, cabinetry, carpet, paints, cleaning products (not mine anymore though!) and even cosmetics. I'm a bit of a gardening nerd myself and can't wait to get my green thumbs dirty once the renovations are finished, but in the meantime, perhaps some beautiful indoor plants could help ease my need-to-plant-something angst? Leave your new plants in their plastic pots and simply place in a decorative pot once you're home. This means you're able to change out your plants and pots without having to re-pot every time. Spend some time being kind to your new plants, watering and feeding them well for the first few months. Slowly ease back on the TLC, allowing the plant to "harden off" and acclimatise to its new environment. To clean the leaves of your plants (something you should do monthly to allow the plant to photosynthesise effectively) simply wipe over the leaves with a solution of one part water to one part milk. This cleans the leaves of any dust that may accumulate, leaves them shiny and glossy, and also keeps the leaves free of dust for longer. In summer the plants will probably need watering 2-3 times a week, while in winter this will dial back to once every 2-3 weeks. I'm keen to get some green action over the next few weeks (the middle of a heatwave is not the best time to buy and plant plants, so I may hold off for a little bit) and once I do I'll share some photos of the new additions. I love me some maiden hair ferns and some bamboo palms, but we'll see what we end up with. Off to jump in the kids' paddle pool now! I love love love bromeliads! I wish we had a corner of the garden that was shady enough for a whole lot of them. But I may just try one indoors!